My name is Ananya and I am from Harare, Zimbabwe. I am currently studying Fashion Design at Parsons in New York City. This is one of my favourite projects because I feel very strongly about the meaning behind it, and the point I was aiming to achieve. The final piece consists of 7 polaroid photos. The whole objective of this piece was to stand up for women and girls who feel that they need to have a certain body to be accepted in today’s society. I tell this story by using various symbols (each with a specific meaning), certain colours, and magnifying glasses on some parts of the body. The objective of this was to make a statement of saying no to eating disorders and body shaming. 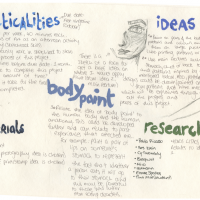 A mindmap constructed while thinking about “body paint” as a topic. Inspiration was taken from the list under “Research”. A minimum of three ideas were written to ensure that there was enough to focus on. 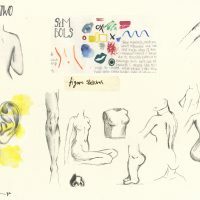 Research Sketches to show the study of the human body, and specific parts that might be an area of focus further on in the project. An example of colour coding each symbol that is used would be this symbol because the symbol on its own, represents tears. It is said that when people go through depression, they prefer to stay out of attention and sincere. Therefore, instead of painting the term grey, the colour scheme matched the meaning and the symbol. 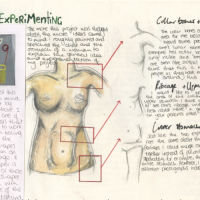 The sketchbook scan represents an explanation of the parts of the body needed to be focused on and I think that this was important to have a rough idea of which route to take for my final piece. Also, sketching helped gain knowledge and observations of what I would be working with and this contributed to the final decision. 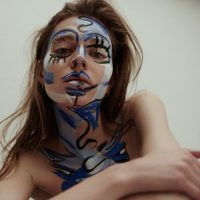 As part of an editorial for Sicky Magazine, photographer Marcin Kempski and makeup artist Aneta Kostrzeewa decided to combine painting on a body with fine art and photography. These photographs are said to be inspired by artists such as Basquiat, Hofmann, Klein and Miro. After seeing this series of photographs, I wondered if there was any meaning or emotion that was unpublished. With no way of finding out, I was inspired to create my own version of this theme, with a meaning. The whole objective of an obvious yet hidden meaning was to spark thought for viewers but at the same time, allow them to observe the piece, and understand it. Along with these photographs, I was inspired by artists such as Picasso, Haris Lithos and Cy Twombly however, these artists inspired ideas whereas these photos inspired a project. 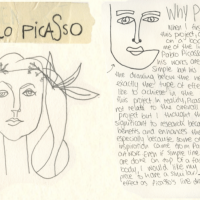 Picasso seemed to be an important role in the inspiration and influence on this project. His simplicity yet his ambiguity motivated me to create a similar type of effect when drawing on the body. 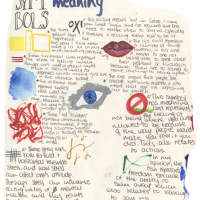 Picasso’s simple line drawings have inspired this project because of its simplicity. To me, this simplicity brings out more character in the final piece or final photo. I decided to develop my own creations and ideas inspired by Picasso and then applied this to my project. Materials. 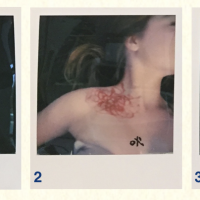 A polaroid camera was used to photograph the model after acrylic paint was applied. 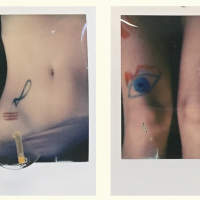 The significance of adding more paint onto the polaroids after they had been taken was to emphasise the idea that both girls and women should be bold and confident with their physical features. However the additional paint contributes to the meaning of the piece. 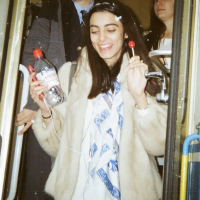 For example, the word ‘oxi’ (polaroid 2) is significant because it means ‘no’ in Greek. This implies that a girl or women affected by society’s ideal body will soon reach the point where she replies ‘no’. Another example is the yellow paint shown in polaroid number 3. Like explained previously, the colour yellow usually signifies happiness and hence, portraying a positive mind. The importance of magnification. This piece contains various forms of media, including 3D. The meaning for this relates to the meaning of the additional paint on the polaroids however, the magnifying glass is placed on one of the body parts that is criticised.